We've fallen into the habit of using Monday's posts to talk about health, medical and safety issues - and even interesting science topics. Lately, we've been looking into the genetics of cat coloring. Even why some cats have blue eyes! A truly solid white cat has the White Masking, or "W" gene to thank for its striking coat. But that's not all a kitty gets from that "W" gene. Because that gene is responsible for masking all color everywhere, that means pigment is masked or blocked in the eyes as well. If you read our post in July about what happens when pigment is blocked in the eye, then you won't be surprised to hear that these "W" kitties have gorgeous blue eyes. 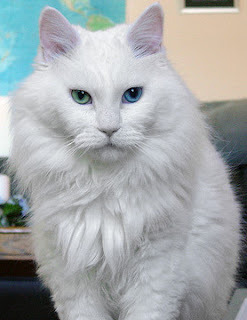 Interestingly enough, this phenomenon causes white cats who have this "W" gene to be deaf. 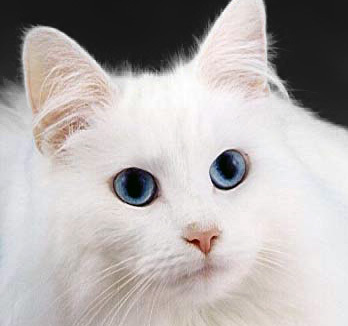 But not all blue-eyed white cats are deaf, you say. Most are, but not all. For those white cats that are not deaf, there is a different gene at play - the Spotting gene. You can read all about the difference between a White Masking gene and a Spotting gene in the post on Monday, August 6. So, what makes a white cat with the "W" gene deaf? Star Trek. There is a spiral-shaped cavity in the inner ear called the cochlea. This is where sound waves are converted to electrical signals and sent to the brain for processing. In order for those electrical signals to be transmitted upstream to the brain, ion balance needs to be maintained. We have no idea what ion balance is, and if you figure it out please let us know, because we're weird like that and love to get our geek on. No melanin means no ion balance. No ion balance means no sound transmission. No sound transmission means complete deafness. Oh by the way, our Maxwell’s deafness isn’t caused by that. He’s got plenty of melanin in his ears! His blue eyes are caused by the albino gene, and while that does turn off pigment in select areas of the coat and eyes, it leaves the melanin in the ears untouched. MOL! Um, hmm, with all three of us having both light and dark furs, we get to leave our calling card on Mommy every morning! SCORE! MOWZERS! How cool is that! Beam me up Doc! We like your "medical Monday" posts!!! That is very interesting to understand why white cats are often deaf. Thanks! Very interesting. Have good Monday. It's the Klingons.. all their fault!! :) I to like these posts, oh so informative. Fanks Connie!! We think it's Klingons too. Maxwell: Oh they are! A friend mama volunteers with adopted one and named her Cloudy. She's deaf like me and so very clever AND beautiful! I think this is all really fascinating! I had no idea it was the lack of melanin that caused kitty deafness! We didn't either - like we said, that tidbit totally had mama gettin' her geek on! It's life Jim, but not as we know it!! Furry interesting indeed! White cats are beautiful though we don't see so many now. Maybe because if they are deaf they are generally kept inside!! MOL!!! Just so long as no one sez "he's DEAD Jim!" oh wait...maybe it should be "he's DEAF Jim..."?? We had a deaf white kitty named Chuckles! He was quite the trickster and he loved to knock things off the counter...Mommy lost TWO teapots that way. He had the loudest ME-OW, ever. Maxwell: Yes, it seems we deaf kittehs either have sooper LOUD meows, or none at all, since they have no way to gauge volume! Mine's a teensy little "mew" momma sez. Funny, I knock things over a LOT. Momma sez I am constantly getting into EVERYthing! As Mr. Spock would say ... "Fascinating." Thanks for such an interesting post, friends! We really enjoy your medical Mondays! MOL! We identify since we's got the pointy ear thingy goin'! That is so interesting and we never knew that before either. We're enjoying your scientific tidbits. Huh? Come again? ¿Como? Couldn't hear you! HAH! Mom used to have a white kitty named Sheena, but she had green eyes and definitely wasn't deaf. EK has blue eyes, but he's not deaf either. MOL! Us too! After mommy wrote this for us, we needed a good Da Bird session to de-spaz us. I always like learning more fascinating stuff like this! We like the geekness. Our Sally was pure white and purely deaf but had green eyes. We don't remember her but our mom does. Mowzers, we bet Sally was beautiful! Fanks Savvy! Mommy likes writing them! Well, we learned something today! Thanks for that!! Wow.....well I for one (and Mommy for TWO) find all of this very interesting really. The science of kitties - we ARE truly mysterious aren't we? Yup, we don't want the humans to figure us ALL out completely - where's the fun in that?~? my Mommy Loves your Mommy's geekiness! So Glogirly wants to know if your mom's got any Trekkie costumes hanging in her closet. And I want to know if she can do the funny V thing with her hand.